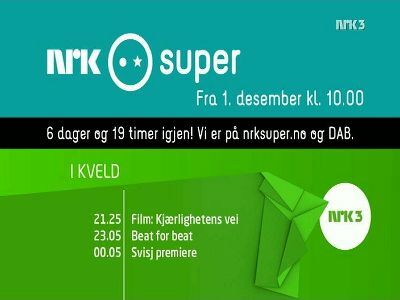 Viasat: NRK Super (Norway) broadcasts in DVB-S2 VideoGuard on 12015.00MHz, pol.V SR:27500 FEC:3/4 SID:18014 PID:1118[MPEG-4]/4414 Norwegian. Viasat: New frequency for NRK Super: 12015.00MHz, pol.V (DVB-S2 SR:27500 FEC:3/4 SID:1041 PID:1118[MPEG-4]/4124 Norwegian,3113 Norwegian- VideoGuard). Canal Digital Nordic: New frequency for NRK Super: 10747.00MHz, pol.V (DVB-S2 SR:25000 FEC:3/4 SID:18014 PID:1118[MPEG-4]/4414 Norwegian- Conax). NRK Super switched to Thor 5 satellite at 11372.00MHz, pol.V (DVB-S , 11372.00MHz, pol.V SR:24500 FEC:7/8 PID:521/676 Norwegian). Viasat: A new channel has started in DVB-S VideoGuard: NRK Super (Norway) on 12015.00MHz, pol.V SR:27500 FEC:3/4 SID:3510 PID:521/676 Norwegian. Canal Digital Nordic & Viasat: A new channel has started in DVB-S Conax & VideoGuard: NRK Super (Norway) on 11372.00MHz, pol.V SR:24500 FEC:7/8 SID:3510 PID:521/676 Norwegian.